The Diamond side table is part of a collection of modular tables. 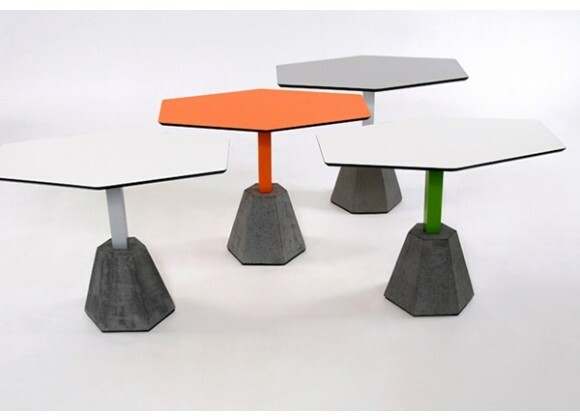 The design uses a cut natural Granite hexagon base, the small diamond side table uses a square pole and a hexagon top. The frame and structure on the Diamond series is finished in a powder coated aluminum frame. The table tops are finished in CL compact lamination. The product is designed for the outdoors but can be used indoors as well. Square pole and a hexagon top. Table tops are finished in CL compact lamination. Designed for the outdoors but can be used indoors as well. Top: 23.6" x 15.7", Base: 9.8" x 9.8"